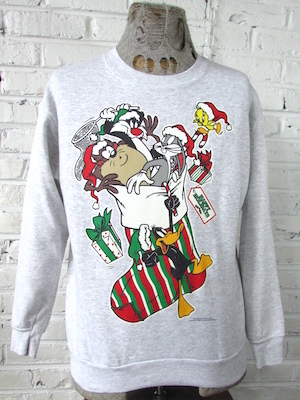 (Mens M) Ugly Xmas Sweatshirt! Looney Tunes Gang Comin' Out of a Stocking! Home > Ugly Christmas Sweaters > Ugly Christmas Sweatshirts > (Mens M) Ugly Xmas Sweatshirt! Looney Tunes Gang Comin' Out of a Stocking! Vintage ugly Christmas sweatshirt! Looney Tunes holiday stocking explosion! What's up Doc is that Bugs, Daffy, Tweety, Sylvester and the Tasmanian Devil popping out of a green and red striped holiday stocking! 100% Acrylic. Condition: Very Good. Has some cracking in the image and two small light orange-ish stains on the upper left portion of the sweater. Does not detract from the awesomeness of this sweater!